Forms and functions always go together in order to effectively build a house project that will expose an innovative and modern design. Open layout also matters to be able to connect the outdoor features to the indoor. Dramatic effect and great ambiance are usually achieved when these three important elements combined. Now we will be sharing to you a house design that has an open plan layout that efficiently incorporates all the character in the exterior to its interior. 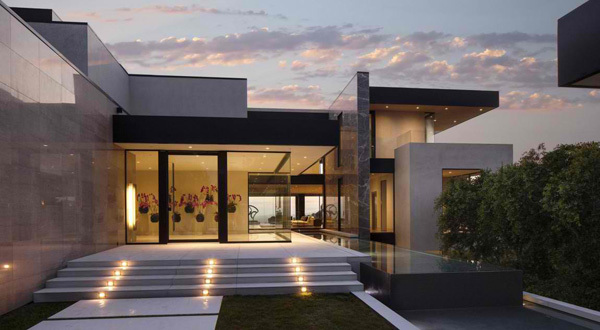 This house is named as Sunset Strip and it is located in California, USA. As you can see this house has an optimistic open space that has advantages of accessing the natural light. 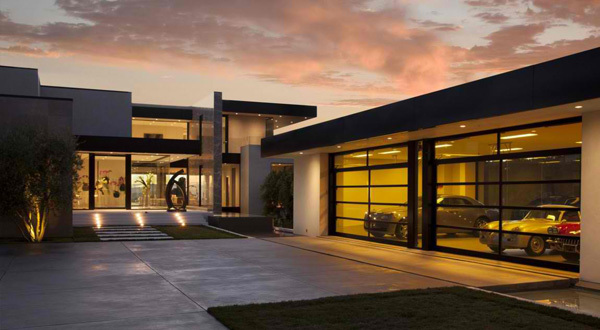 The designer said that the house is approached by means of a gated driveway and guard house. A landscape hedge is visibly seen as the homeowner pass through the gate. The drive court is located between the house, garage, and the guest house. Why don’t we explore the different areas of the house and see the importance of forms and functions in the house through the images below. The glazed walls of the house building efficiently expose the fabulous interiors that blend well with the elegant characteristics in the pool area. 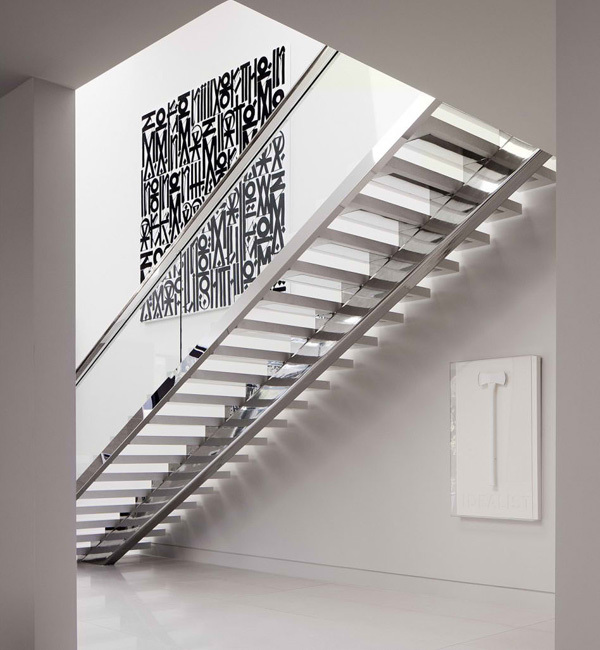 Lights installed in the stairs of the entrance shows a luxurious look of the exterior. 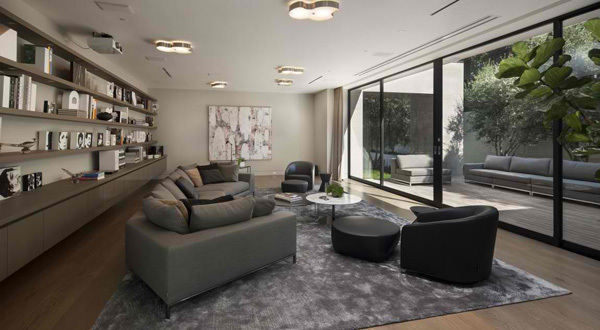 Unique and spectacular shapes of the lamp installed in the ceiling match well with the forms of the sofa set in this living space. 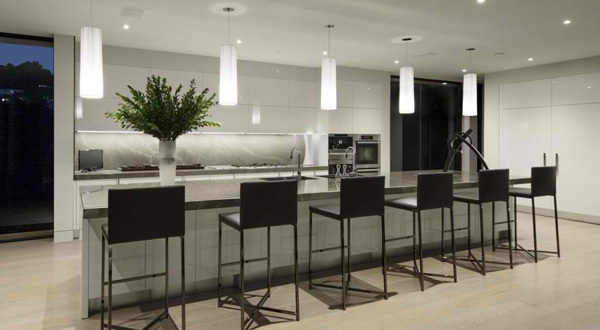 At night time, the arrayed lights in the interiors may effectively highlight its elegance and modern design. Fireplace set in the living space adds comfort and charm that may ensure the client of the relaxing experience they requested. 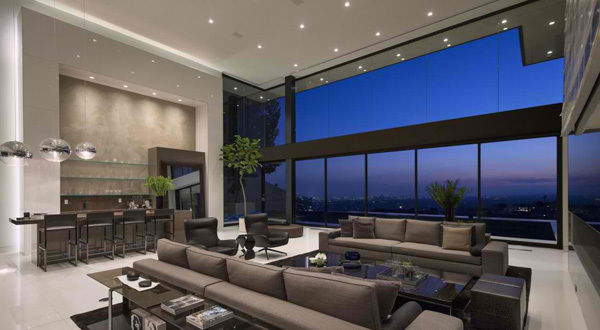 Glass material is one of the best elements of the house that features its open-layout design. 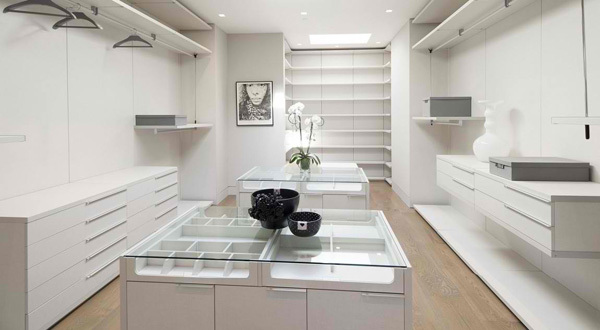 Modern space and furniture as well as the accessories are the vital features of this kitchen to make it sophisticated. White spacious room designated for the dress and other personal accessories of the client are secured here. 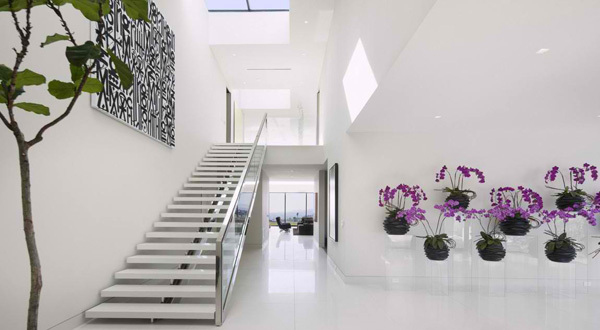 Stylish and neat staircase are placed here that complements with the wall design. Green plants and violets may obviously break the monochrome color of the interior. 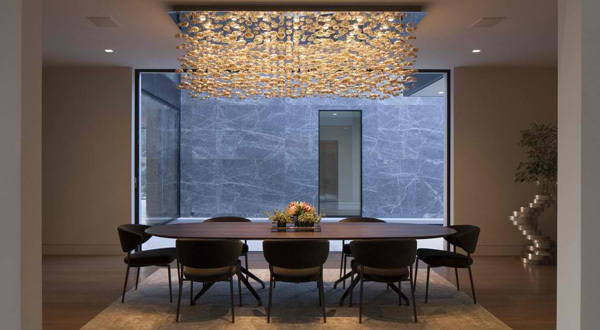 The exceptional and extraordinary chandelier hanged above this dining area can creatively result into a great ambiance. Expensive and durable materials in the furniture are still perceived even at night. 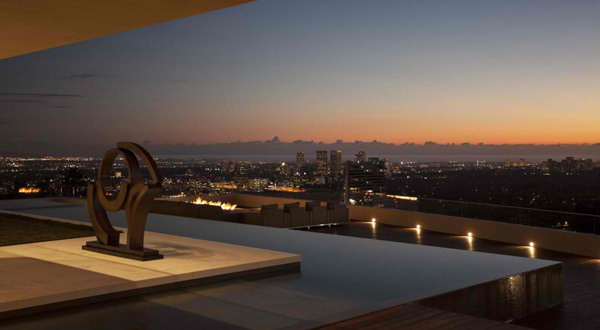 A sculpture set in the pool area can emphasize the artistic idea and concept of the designer. 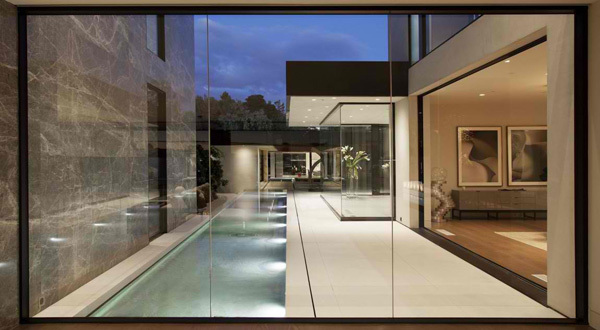 See how the limited space of the exterior accommodates the enchanting swimming pool. Vivid lights in the garage emphasize the expensive and latest vehicles of the client. With the set of images presented by the designer, we have obviously seen the significant advantage of the different areas of the house. I am impressed how the McClean Design successfully designed the stylish exterior with fireplace and swimming pool. These definitely creates an enchanting and luxurious experience for the client. 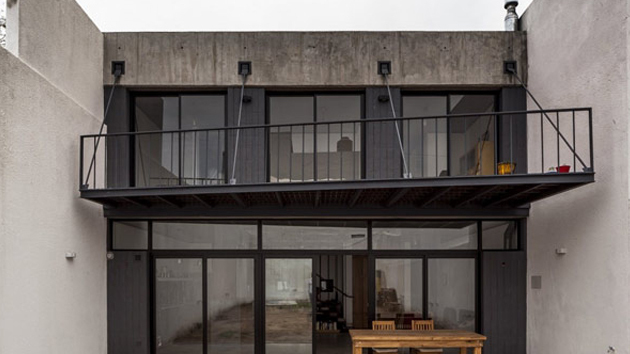 With all the features shown above from the exterior to the interior, we may say that the designer successfully put his effort in order to come up with impressive features and style. We hope that you have learned something new today from the house design we have shared to you.